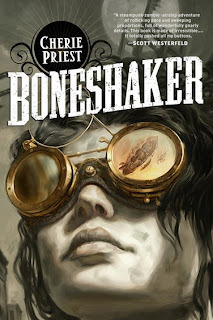 SciFiGuy.ca: Steampunk and "The Clockwork Century"
One of my most anticipated reads for 2009 is coming this October 13 - the steampunk novel Boneshaker by Cherie Priest. Now there is a website called The Clockwork Century dedicated to this alternate-history series. The new website has early reviews and lots of background material. Cherie reveals that there are already four stories pending in the Clockwork Century universe including Boneshaker, the short story Tanglefoot which is already available for free from Subterranean Press, Clementine also from Subterranean Press in 2010 and Dreadnought coming in fall 2010. Thanks to SF Signal for the link. This sounds so freaking good. For some reason I was under the impression that this was going to be a YA novel (maybe the Scott Westerfield quote?) but the synopsis doesn't seem to support that, does it? Hi Meljean from the bonus material on the website this sounds like it is going to be wilder than the Wild Wild West. Pretty sure this isn't YA. Boneshaker sounds interesting. Hope it isn't a YA novel, we adults like this stuff too! Check out my first and recently released novel, Long Journey to Rneadal. This exciting tale is a romantic action adventure in space and is more about the characters than the technology. This is already on my wish list - I agree, it looks really good. I've only read two books by Cherie Priest, but both were beautifully written. She has a pretty good knack of writing stories with a gothic flare. I'll be looking forward to this one. Hello everyone - and thank you so much to the SciFiGuy and commenters alike. FWIW, the book isn't specifically YA; but there are two main point-of-view characters -- one of whom is fifteen years old. His is a secondary thread, but the book is mostly told from his mother's standpoint. This having been said, I'd love to see a little YA-crossover action. 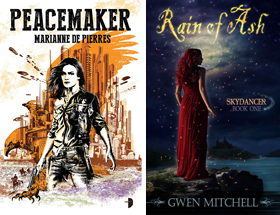 The YA market is a great one. Michelle we'll compare notes once we've read it! Well said PopinFresh - I couldn't agree more. Hi Cherie thanks for dropping by and sharing those extra tidbits. There has been lots of buzz about this book and it seems to be on a every bodies TBB list. The new website looks great! Having been entirely too lucky and possessed of an early galley of BONESHAKER--it's phenomenal. Tied for my first-place read of the year so far. That's a gorgeous cover. I spied this on Hunting Mosters (http://joshuamreynolds.blogspot.com/2009/07/boneshakin.html) and thought it would be a very interesting read. Something to keep an eye out for, I guess. Not that long to wait Suzie! Caitlin I'm betting this one makes a lot of lists this year. When are you and Cherie going to collaborate on a project? Don't know it Dale. Maybe some fans of the game will try Cherie's book! Rabid Fox hope you get a chance to read it! I was one of the lucky ones to read a galley of BONESHAKER. A must read. Mario you can be sure it will be on my must read list too and you are oh so lucky to get to hang with Cherie on your west coast tours (and vice versa of course).